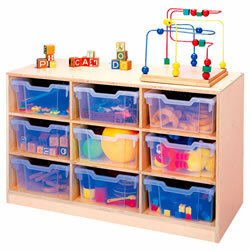 Kaplan provides easy-to-access storage units to keep every classroom organized. 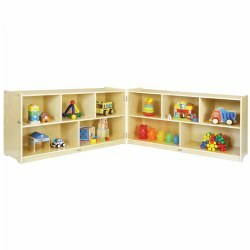 Our selection features see-through, curved, and teacher modular storage units made of solid wood, lightweight acrylic, or durable plastics. 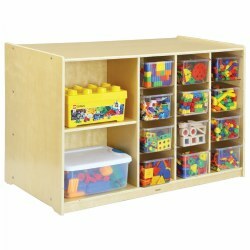 For accessory storage, be sure to browse our lockers, cabinets, and storage baskets. Our audio centers are ideal for storing educational videos, headphones, CDs, and other media. 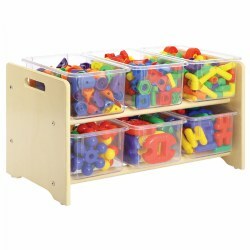 For small books, crayons, markers, and toys, our selection of caddies and baskets fit perfectly into each classroom. Now it's easy to find what you need. Unit includes 12 clear trays. Assembly required - Tools provided. Baltic birch. 21"H x 35"W x 14"D. 15 lbs. 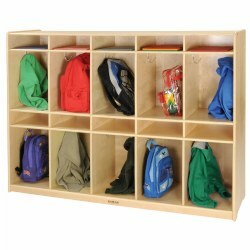 This space-saving locker provides 10 easily accessible spaces for bags, coats, papers, and parent communication. Fully assembled. Measures 48"H x 60"W x 15"D. Easy to clean, durable UV-protective finish. Fully rounded, child-safe corners and edges. FSC certified. Contents not included. 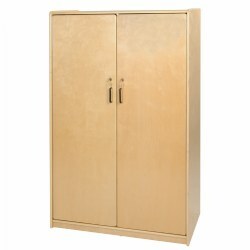 These Baltic birch storage cabinets are built for incredible toughness. Featuring fully-rounded edges and corners for safety. Extra durable lacquer finish. Measures 30"H x 48"W x 15"D. Toys not included. 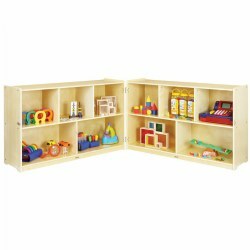 Arrange your classroom with attractive, strong, child-safe birch plywood furniture. 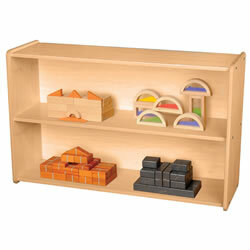 At 30" tall, this versatile single-sided unit features 2 shelves for storing toys or supplies or larger manipulatives. Features a toe-kick panel that prevents small objects from being lost underneath. 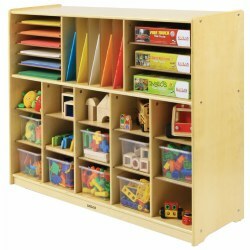 Perfect for organizing classrooms, this unit is also an ideal playspace divider. Fully assembled. 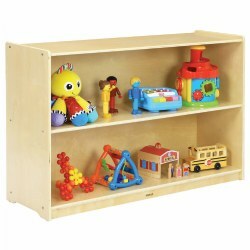 Measures 30"H x 48"W x 15"D. Toys and other contents are not included. A room divider, double-sided shelf storage, and display table all in one unit! Space for 12+ storage bins (sold separately). Fully assembled, except casters. Each side is 12" deep. Measures 30"H x 48"W x 24"D. Bins and toys not included. Both sides have five roomy spaces. Top is a large work area! Heavy duty casters make it easy to position. Baskets sold separately. Fully assembled. Measures 30"H x 48"W x 24"D. Toys not included. 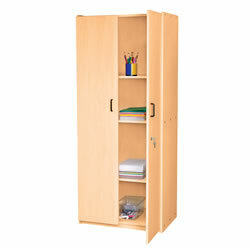 Arrange your classroom with attractive, strong, child-safe birch plywood furniture. At 30" tall, this narrow storage unit offers space for eight storage bins or wicker baskets (sold separately.) A toe-kick panel prevents small objects from being lost underneath. Keep clutter to a minimum with bin storage, in this attractive, space-saving unit. Fully assembled. Measures 30"H x 19 1/2"W x 15 1/2"D. Baskets and contents not included. Birch plywood construction with fully rounded child safe edges. 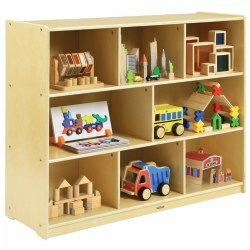 Room for up to 15 bins and ample storage for art supplies, literacy or music needs and much more. Heavy-duty casters. Bins sold separately. 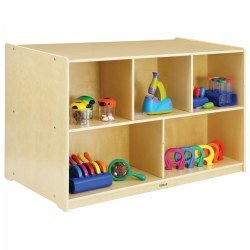 Measures 36"H x 48"W x 15"D.
This locking cabinet provides multiple shelves and cubbies of varying sizes to store any items you choose. Additional side-locking cabinet is the perfect place to store medicines, personal belongings, and more! Fully assembled. Measures 59"H x 36"W x 20"D. Contents shown are not included. 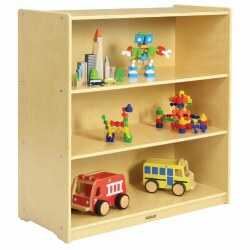 Our sturdy birch laminate storage cabinet comes with 9 clear storage trays and has heavy-duty casters for easy rolling. 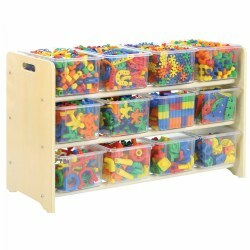 The rigid plastic bins will endure years of use and can be stacked during playtime or nested when not in use. 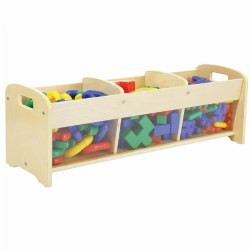 24 1/2"H x 40 1/2"W x 17 1/2"D.
Its size allows toddlers to reach into bins for manipulatives. Unit includes 6 clear storage bins. Ready to assemble - tools included. 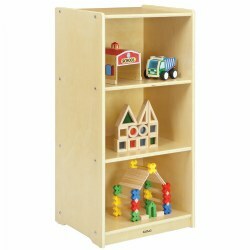 14"H x 26"W x 14"D.
No child is out of your vision when you have this two shelf storage unit. Clear acrylic panel on the back allows you to see through to the other learning areas. Makes an excellent room divider. 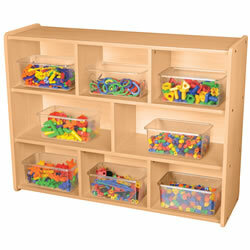 24"H x 36"W x 15"D.
Open up your classroom with our see-thru plexiglass panel storage unit. 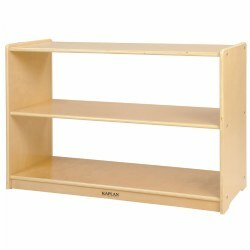 Measures 24"H x 36"W x 15"D.
This fully functional, locking, audio center on wheels is constructed from Baltic birch. 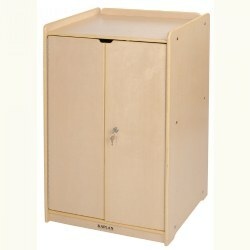 This unit has fully rounded child safety edges and seven storage areas for headphones, CD player, CD's, and other media. Unit includes a deep storage tray and a shallow storage tray. Fully assembled (must attach casters). Measures: 36"H x 22"W x 20"D. Other contents not included. Children love to dig and explore new things. This low to the ground storage bin allows any child the pleasure of finding something new. 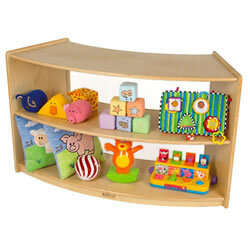 Constructed of Baltic Birch with clear plexi-glass sides and child safe rounded edges. 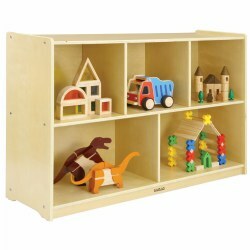 Size: 12"H x 38"L x 12"D.
Provides maximum space and security for personal items as well as materials that need to be kept safely out of children's reach. Locking doors with 2 fixed shelves and 2 adjustable shelves. Assembly required. Measures 72"H x 30"W x 20"D.
Sized just right for small spaces with deep shelves to allow plenty of storage space. Fully assembled. Measures 36"H x 18"W x 15"D. Contents not included. 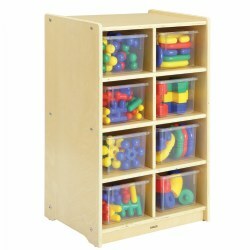 Eight compartments provide lots of storage for classroom materials. Fully assembled. Measures 36"H x 48"W x 15"D. Contents and bins are not included. Open shelves have room for larger manipulatives. Fully assembled. Measures 30"H x 48"W x 15"D. Contents not included.